8 In the social sciences we are taught a number of safe, orthodox theories. Our foreign policy -- colonialism and now imperialism -- is explained as a necessary maintenance of the "balance of power", ie: the status quo. 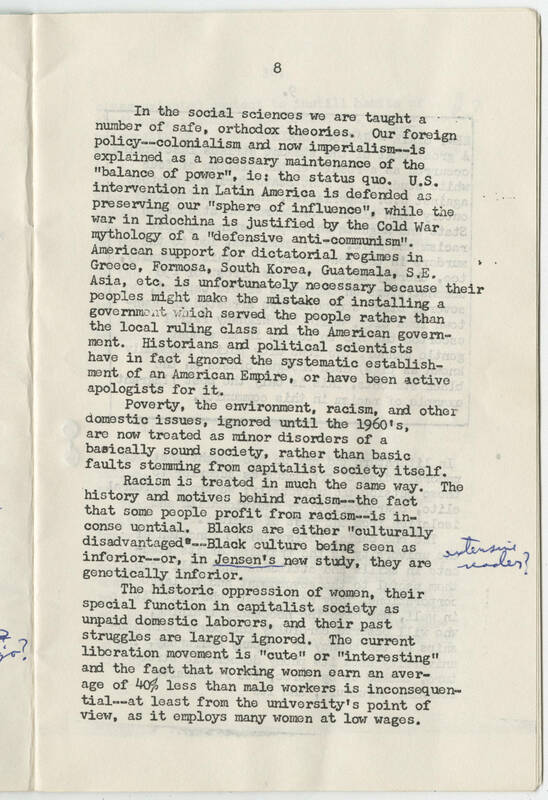 U.S. intervention in Latin America is defended us preserving our "sphere of influence", while the war in Indochina is justified by the Cold War mythology of a "defensive anti-communism". American support for dictatorial regimes in Greece, Formosa, South Korea, Guatemala, S.E. Asia, etc. is unfortunately necessary because their peoples might make the mistake of installing a government which served the people rather than the local ruling class and the American government. Historians and political scientists have in fact ignored the systematic establishment of an American Empire, or have been active apologists for it, Poverty, the environment, racism, and other domestic issues, ignored until the 1960's, are now treated as minor disorders of a basically sound society, rather than basic faults stemming from capitalist society itself. Racism is treated in much the same way. The history and motives behind racism -- is inconsequential . Blacks are either "culturally disadvantaged" -- Black culture being see as inferior -- or, in Jensen's new study, they are genetically inferior. The historic oppression of women, their special function in capitalist society as unpaid domestic laborers, and their past struggles are largely ignored. The current liberation movement is "cute" or "interesting" and the fact that working women earn an average 40% less than male workers is inconsequential -- at least from the university's point of view, as it employs many women at low wages.